Proprietary Name: Chloraseptic Sore Throat (kids Grape) Grape What is the Proprietary Name? Non-Proprietary Name: Phenol What is the Non-Proprietary Name? 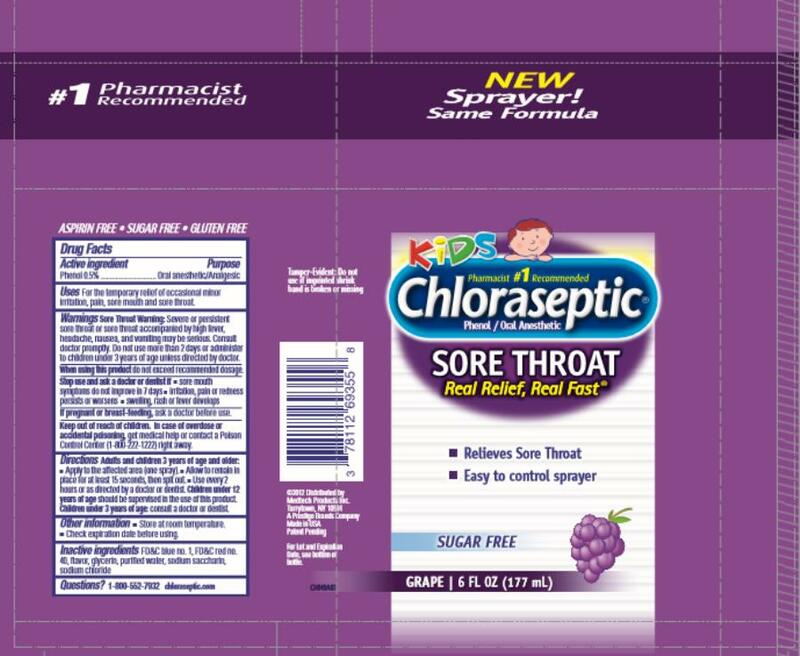 Chloraseptic Sore Throat (kids Grape) Grape with NDC 0295-9355 is a a human over the counter drug product labeled by Denison Pharmaceuticals, Llc. The generic name of Chloraseptic Sore Throat (kids Grape) Grape is phenol. The product's dosage form is spray and is administered via oral form. Swelling, rash or fever developsIf pregnant or breast-feeding, ask a health care professional before use. Adults and children 3 years of age and older:Apply to the affected area (one spray). Use every 2 hours or as directed by a doctor or dentist.